The following information was compiled to organize a study for learning about maps and how to make them (Cartography). The topics are for upper elementary or middle level. Students should have previously learned beginning map skills and concepts of relative position and motion. The information includes activities and questions to review map skills and moves into learning different strategies for mapping places and making maps. The length of a person’s pace may vary. The average of a person’s pace can be used to measure between two places by counting the number of paces and using that with the average length of the pace to measure the distance. A person can measure the length of a pace by counting the number of paces a person makes over a known distance and find an average. 2. The position of an object can be located from a baseline if the distance along the baseline, from a benchmark/ datum, is known and the distance to a point at a 90-degree angle from the baseline. A baseline is a straight line from a benchmark/ datum. A baseline can be visualized with a string or cord attached to a benchmark/ datum and pulled straight. 3. Positions of objects or features can be located to a benchmark/ datum, by triangulation. 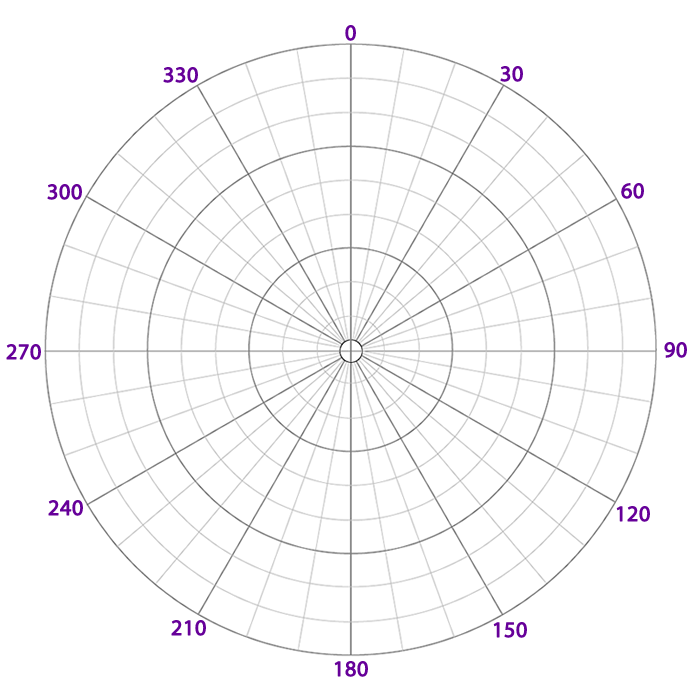 Triangulation is a procedure used to locate positions by dividing a region into a series of triangular pieces based on lines of known length that intersect at the point to be located; and the other ends of the lines join the base of a triangle of known length between a benchmark/ datum and another know point (another selected benchmark/ auxiliary datum). 4. Positions of objects can be located from a benchmark/ datum with a direction (azimuth) and distance. Direction of an object can be measured in degrees using a transit located at a benchmark to measure the angle of declination from north (azimuth). Distance can be measured from the same benchmark to the object using paces or measuring cord. 5. Contours can be mapped by measuring distance from a baseline. Baseline is used to measure contours. It can be made by extending a cord over the contour so that it is level with the Earth, measuring intervals of distances from a benchmark/ datum/ (start of the baseline) along the cord and then measuring the distance from the points on the cord of each interval distance to the point on the contour directly below (perpendicular to) the cord/baseline. 6. The height of a tree, flagpole, building or some other object can be measured with a grade/slope/angle/ and a known distance. 7. The grade/slope/angle of a surface can be measured with a clinometer. Azimuth, the distance in degrees (angular) from a fixed direction (north) baseline is a straight line from a benchmark. Clinometer is an instrument used to measure vertical angles. Directions to make a clinometer. Datum is a point, line, or surface used as a reference point. Declination is a deviation from a specific direction or standard. Degree is a unit of longitude or latitude. Which is 1/360th the circumference of the Earth or a circle. Grade is the degree of inclination/ slope of a road or other surface. Pace is the distance of a step a) a stride or step, about 30 inches. b) a point measured from where the heel of one foot lifts off the ground to the point where it is put down again after the step of the other foot, or five Roman feet or 58.1 inches. Transit is an instrument to measure horizontal and vertical angles. Traverse is the line or web of lines created by sighting and measuring when surveying a tract of land. How to draw Earth distances to scale on a map. Get a local map or a state map. In groups of alone, explore it. Use the following form, to write questions, answer them, exchange yours with another student or group, complete each set, exchange back and discuss. Find and make a list of your top ten points of interest. Make a graph of cities by their first letter. Make a graph of cities according to the number of syllables they have. Make a graph by how many cities in each county. What is the higest elevation? What is the higest lowest? How big is a city, county, state, country. How wide is the …. How long is … What is the area of ... What does wide and long mean? Can there be more than one answer? How does it compare to area? What kinds of highways are there. Where do the meet, intersect, interchange. How many interstates? How many exits on interstate ……. ? Measure distance. What is the average between exits? Where could you travel on a tank of gas? Chart the lengths of ___ rivers. If there are historical trails or routes, how long are they? Directions. Choose a town at random, give directions on how to get there from here. Turn around and give directions in reverse. How are they different? How are they the same? Distance and direction. Plan a trip from a city that starts with the letter A to a city that starts with the letter B to … letter Z ? In a state. How far would the trip be? What directions and distances can be given to another person travel from start to finish. If you traveled from …………. to ………………. what alternative routes woult give different distance? Check with Google map, WAZE, or other GPS service. Why do these services give two different types of directions? How much did interstate …………. cost? If you left at ………. and traveled to …………. about what time would you arrive (not breaking any speed limits now). If a person left on the Oregon trail and traveled ____ miles a day, when would they arrive in Oregon? If you were at the pump which of the following could you see better? What direction is cabin F from cabin B? Using the pump and flagpole as a base line locate the cave. Starting at the flagpole use one direction (azimuth) and distance to locate the cave. How many meters long is the sidewalk from the parking lot to the lodge? What direction is the ball field from the lodge? Use an azimuth (direction from north) and direction to locate the meteorite. What cabin is directly east of C? What cabin is west of F? Why can’t you locate the ball field? What is located on the lake? Where does the needle of a compass point? One cm on the scale is how many meters? Bonus Question 1 inch on the map is equal to how many inches on the Earth? What direction is point B from point A? Using points A and B as a baseline locate point C.
Starting at point C use one direction and one distance to locate point D.
How many meters from C to E? Use an azimuth and a direction to locate point C from point B. What point is south of B? What point is west of B? What direction is D from C? What direction is A from C? What direction is C from A? What direction is C from E? What are the dimensions of the house? Bonus: Which two of the following are in the Northern Hemisphere? Materials: String or cord to make a measuring cord that is at least 50 meters long and something to wind it up on. Magnetic compass, clinometer or protractor, straw, string, and washer to make one. Transit or materials to make one wood or cardboard 10 inches square, 360 degree polar coordinate, nail, pointer. Plan to make a photo log to document your drawings, maps, notes, and photographs. Use a page (electronic or 8 1/2 x 11 inch white paper) to paste a photo related to the exercise. Use at least one page for each exercise. Title each page and label each photograph so that all references can be located in pictures. Be sure the word processer numbers the pages. If it is not electronic, add a heavy paper cover, back page and bind, staple, or other kind of permanent fastener. Use the following activities to solve problems with maps, measure, make maps, and use maps for finding points of interest or orienteering. Document your investigations in a photo log with drawings, notes and photographs. Use the Lost at sea map and problem and locate the lost. What is orienteering? And how to orienteer. How to read a contour map. 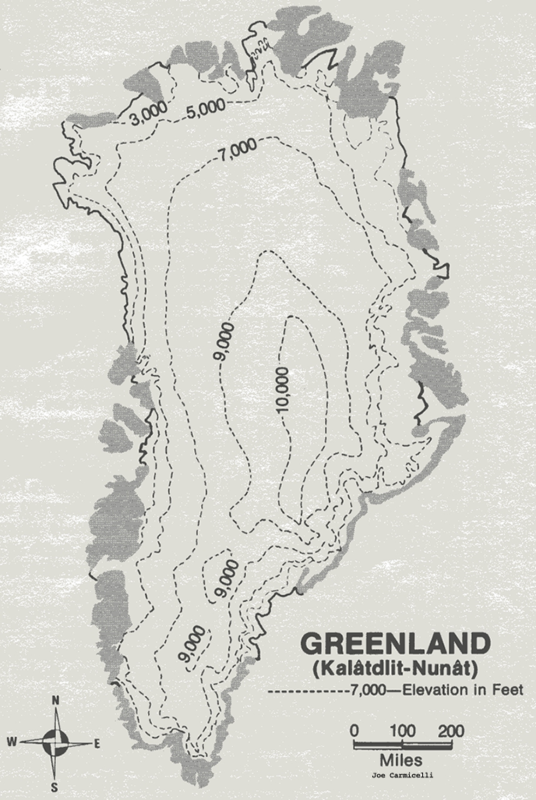 Sample topographic map of Greenland. Make a profile or contour map. Select a place like: slope of a surface ditch, side of a drainage basin, or a steep hill. Measure and make a map for it. Enjoy doing activities outdoors? Then, see more activities to do outdoors.